When my husband suggested a relocation to Phoenix four years ago to be nearer to his family, visions of endless identical postwar homes surrounded by dirt and cacti sprang to mind. For a girl who grew up in the green hills of Atlanta and has lived in the Berkshire mountains, Boston, Washington D.C. and London, the thought of a move to the desert was less than thrilling. The pace of life was appealing, as was the closeness to family. But could I ever feel at home in the desert landscape? We decided to take a “get to know Phoenix” trip. Ryan drove me around to countless neighborhoods his mother had suggested we check out. None spoke to me. Many were nice—perfectly pleasant—but I needed a neighborhood with character. A neighborhood with soul. I started to think maybe you couldn’t find that in America’s “new” cities. And then … we found Willo. Covering approximately one square mile and situated in midtown Phoenix just two miles north of downtown, the Willo neighborhood is a breath of architectural fresh air. Prior to 1901, when the first subdivision was platted, the land was a privately held agricultural area. A second subdivision was platted in 1910. The bulk of the homes in the southern half of the neighborhood—including several blocks of bungalows—were constructed in the 1920s and ’30s, abetted by the introduction of a streetcar line that connected the area to downtown. But the Period Revival movement of the time meant homes were designed in a great variety of revival styles, including Tudor, Greek, American Colonial, Spanish Colonial and Pueblo, in addition to Classic and Craftsman Bungalow. The arrival of the Great Depression interrupted development briefly, but it soon resumed. And as air conditioning became widely available, more new homes sprang up. The additions continued until the 1950s, when the last homes were built. Like many urban American neighborhoods, Willo experienced a period of slight deterioration as people flocked to the suburbs beginning in the 1960s. But the allure of the architectural variety, the vibrancy of the community and its proximity to the business and cultural centers of a thriving Phoenix were strong, and in the 1980s residents successfully lobbied for historic designation as a special conservation district. Over the last 20 years, the neighborhood has gone through its own revival as new individuals and families have moved in and long-time residents have continued to maintain their homes. Ryan and I drove the streets of the neighborhood and decided to call a realtor. We didn’t have jobs lined up in Phoenix—we still thought we were just exploring—but we knew we had found the place we wanted to call home. Days later we visited an American Colonial Revival home. I remember pulling up in front for the first time—there were paper hearts hanging in the windows, obviously the project of a child getting ready for Valentine’s Day. I turned to Ryan. “This one’s got good karma,” I said. When we walked through the doors, the karma followed. We entered a large living room that was open to the dining room behind it. The hardwood floors were gorgeous. Candles flickered above the original fireplace. Built-in decorative shelving along one wall held the family’s treasures. A step down to the dining room, between four columns, brought you just steps away from the backyard. The sun came in through the open windows (Phoenix in February! ), and the views to the back were beautiful—a garden full of flowering bougainvillea, a brick patio covered by a lovely trellis, a raised planter where the kids grew vegetables for fun. It took our breath away. A tour of the rest of the house—which didn’t take long, since it was a snug 1,400 square feet—convinced us this was the right first home for us. The kitchen was wide, light-filled and beautifully renovated. The master bedroom was uncharacteristically large. The guest bedroom was small, but, we asked ourselves, how much space do guests really need? The one full bathroom was petite but adequate. The home office that I would use had gorgeous windows covering three of its four walls. 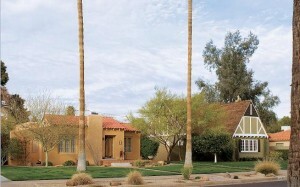 It had originally been a sleeping porch—a very common feature of homes built during this era in Phoenix. In the heat of the summer, families would sleep in open-air porches with damp sheets hung around the perimeter of the room. The evening breezes would cool the air with the humidity from the sheets—sort of an early swamp cooler. In later years, windows were added. I’ve never had an office with that much sunlight. A day after that showing, we were back in Washington, faxing an offer letter and celebrating when we went into escrow. The business of finding jobs in Phoenix quickly sorted itself out, and we joyfully embarked on our cross-country move. We soon came to learn that what was so special about Willo was not just its architectural appeal but its vibrant sense of community. The people of Willo don’t fit into any one mold. There are long-time residents who have lived here for decades. (My next-door neighbor still lives in the house where she spent her childhood.) Then there are those who have moved to Willo more recently—singles, couples, families. Take a walk through the neighborhood on any pleasant evening and you’ll run into dozens of neighbors—some out jogging, many walking their dogs, others pushing their children in strollers. 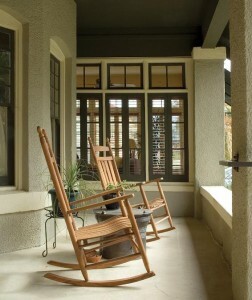 It’s a “front porch” neighborhood. People sit outside, wave to their neighbors and invite them over for a glass of wine. Two years after relocating to Phoenix, we were thrilled to learn that our family would be expanding to include a baby girl. Our daughter arrived about the time half a dozen or so other children were born in the neighborhood. We moms and dads see each other during our morning and evening walks, and we get together sometimes to talk about parenting in Phoenix. All of us have made the choice to raise our children in Willo because it’s such a unique, welcoming and supportive community. None of us can imagine raising our families anywhere else. The residents are also active and engaged in neighborhood affairs. The Willo Neighborhood Association board meets monthly, and I’m always amazed at how many people show up, just to learn what’s going on and to get involved. On one Sunday each February the association puts on a highly regarded home tour that draws more than 3,000 visitors and 100 street-fair vendors. 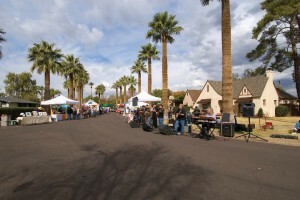 The event is a wonderful way to share our neighborhood with others in Phoenix and beyond, and it serves as the fund-raising event for the neighborhood’s upkeep, beautification and other improvements. The home tour is also a way to get potential new residents interested in Willo. Our neighbors Denise and Jeremy Staley found out about the neighborhood by attending one of the tours. 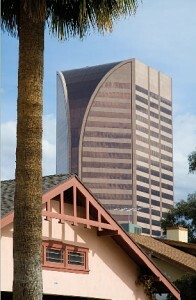 They decided to move from their suburban, “cookie-cutter” house to downtown Phoenix after about three hours in Willo. Denise says they fell in love with the character and charm of the historic district, a stark contrast to newer neighborhoods on the city’s outskirts. Since moving here four years ago, the Staleys have also come to value the proximity to local restaurants, cultural activities and the new light rail system. Directly adjacent to Willo and connecting downtown with points north and with neighboring Tempe (home of Arizona State University), the light rail was recently unveiled and is changing the urban Phoenix landscape. The juxtaposition of this modern convenience with the historic charm of Willo only adds to the neighborhood’s unique appeal. The Staleys’ home, built in the 1920s, is one of the relatively few bungalows in the neighborhood. 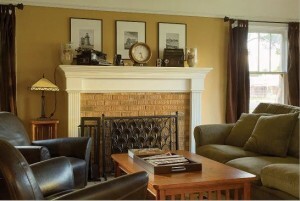 It is fondly referred to as one of the “twin” bungalows. (Their neighbors on the other side, Stacie and David Taylor, live in the other one, and the couples have become fast friends.) It was built as cars were becoming more popular and important, and its large porte cochere is a distinctive feature of the facade. 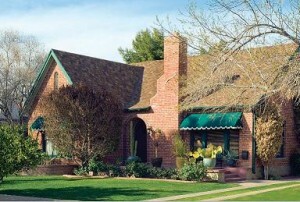 They love the multicolored brick used in its construction and the welcoming front porch. The home has all of its original built-in cabinetry, double-hung windows, coved ceilings, moldings and glass door knobs. They have renovated the kitchen with vintage tile and a period stove, and they’re currently at work on a rear addition that will house a master suite. Mary Peralta, another resident who has been an active presence in the Willo community, grew up in Phoenix. As a student at Phoenix College in the 1970s she rode her bike through Willo on her way to classes. She says the character and history of the homes captivated her even then, and those memories drew her back to the neighborhood a few years ago, when she and her husband, Mark, decided to return to Phoenix after 22 years in New York City. “Our decision to leave New York wasn’t an easy one,” she says. “That city grows on you. But once we got back here, I said to Mark, ‘I can leave New York for this.’ ”Willo resident Kat Soderberg and her husband, Virgil, also made a huge change when they relocated to Phoenix from Alaska in 2001. They didn’t know the city, so they lived in a corporate apartment while they familiarized themselves with the area. They, too, succumbed to the home tour, and this year their simple but stunning Mission Revival home, built in 1929, drew rave reviews from tour visitors. And bad times there have been, most recently several months ago, when the neighborhood was hit by a small but not insignificant tragedy: a short but powerful storm, called a “microburst.” I have never seen anything like it. Winds were close to 100 miles an hour, hail came down so hard I thought all the windows in our house would break. The power went out and didn’t come back on for five days. Almost everyone in the neighborhood suffered some damage—tree limbs down, roof tiles ripped off, landscape walls collapsed. But two dear friends, Tom and Randy, a couple we met on the Home Tour Committee, suffered an unthinkable loss. An enormous, century-old pine tree fell on their beautiful home. Miraculously, no one was hurt. But their home was destroyed. The neighborhood jumped into action. Neighbors ran in to help them salvage what personal effects they could before the house completely collapsed. The family next door gave them a place to stay while emergency services were called. Word spread quickly—it always does—and people from across the neighborhood were there to ask how they could help. Over the next three days, the streets were full of people cleaning up debris, offering to help each other, offering support. Tom and Randy are now rebuilding in the exact footprint of the original home. As for Ryan and me, we’ve done little to the interior of our home other than make aesthetic improvements, but we’ve undertaken a fairly dramatic transformation outside to more fully embrace Willo’s “front porch” culture. Our daughter, who recently turned one, is enjoying running around on the large front patio we’ve just added. We’re out there many evenings enjoying the wonderful weather, a glass of wine and friends and neighbors walking by. Katherine Bair Desmond co-chaired the 2009 Willo Historic Home Tour committee. She and her husband are expecting their second child.